This piece is an excerpt from the free digital report "The Surprising Promise of Bicycling in America" by Jay Walljasper in collaboration with Melissa Balmer of PedalLove.org. 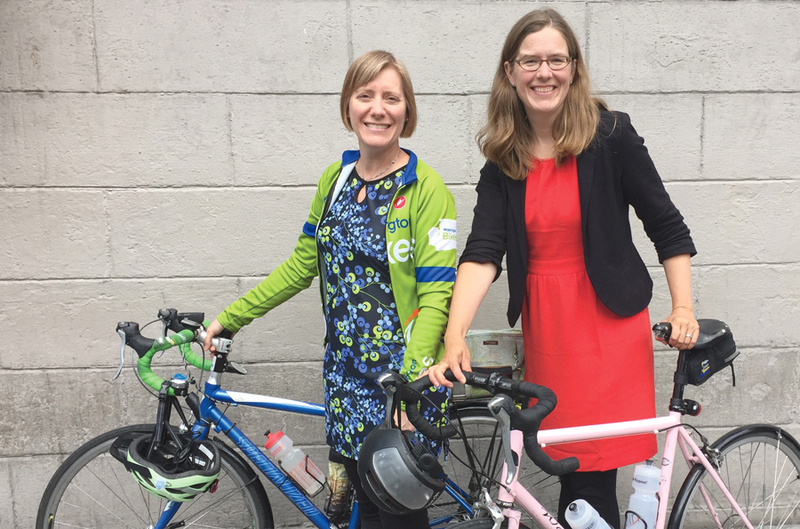 Barb Chamberlain, then Executive Director of Washing Bikes, and Elizabeth Kiker, then Executive Director of Cascade Bicycle Club, successfully merged their two organizations to become the largest state-wide bike advocacy organization in the nation. One organization brought strengths that complemented each other. The merger increased overall capacity, helping accomplish the mission of growing bicycling for all statewide through effective policy advocacy and successful programs like the Major Taylor Project that empowers youth from diverse communities through bicycling. Image courtesy of Cascade Bicycle Club. The Increase of Women in Bike Advocacy Leadership is the number 3 of 12 reasons bicycling will continue to grow in the U.S. The most recent comprehensive data we have on women riding bikes in the U.S. is from the 2009 National Household Travel Survey which reported women only make 29% of all bike trips. The latest survey was completed in 2016, however, an update on women biking has not yet been released. What we can track, however, is the exponential growth of women in bike advocacy leadership. Sadly, two of the most talented women on the national bike advocacy leadership stage lost their lives tragically young. Susie Stephens, the co-founder of the Alliance for Biking and Walking and its first Executive Director was killed while walking in a crosswalk in 2002 at just 36, and Deb Hubsmith, Founder and first Executive Director of the Safe Routes to School National Partnership died in 2015 from leukemia at 45. Fortunately, there has been a growing array of very talented women involved in bike advocacy from the get go, but in the early days those women could certainly feel a bit, well, rare. Lawyer Kit Keller began her professional career in bike advocacy in 1990 when Linda Tracy invited her to apply to work on a Mountain Bikes on Public Lands project as a consultant for the Bicycle Federation of America. Keller won the project, and the handbook that resulted from it about this new "user group" was used in all 50 states. 1990 was also the first “Pro Walk/Pro Bike” conference for biking and walking professionals and advocates. Keller thinks women may have made up 10% of the audience. 2016 was the first year that the Pro Walk/Pro Bike: Pro Place conference collected demographic data on their attendees and presenters. For attendees the breakdown was 42% male, 46% female, and 12% other. For presenters it was 45% male, 50% female, and 5% other. "A lot of bicycle products aren't designed for men specifically, but you do get the feeling they were picturing men using them when creating them. I've learned the value of involving people whose needs and desires are often ignored or minimized." Originally from Chicago, now in Brooklyn NY, Maria Boustead is the Founder/Designer of Po Campo and a League Board member. 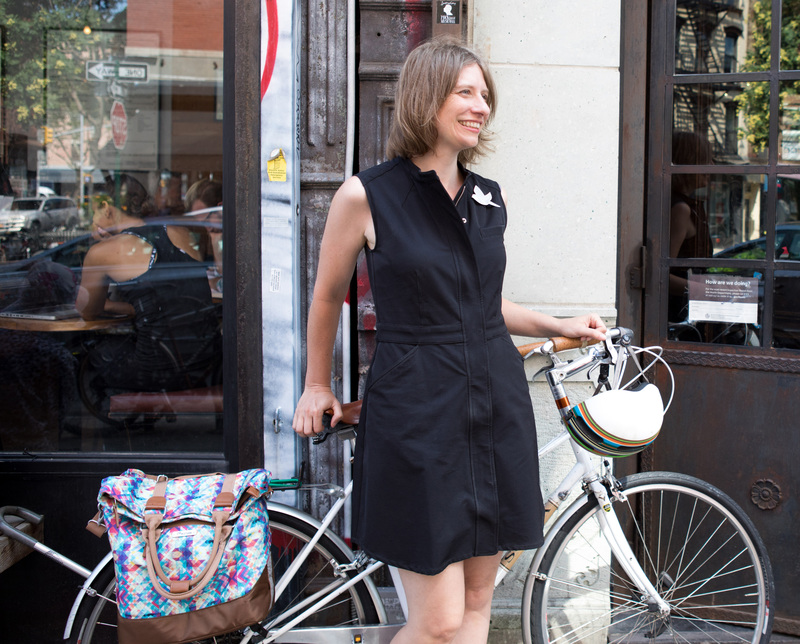 She produces the fashion forward bike-friendly bags to make life-by-bike much easier. This year she became a member of the League of American Bicyclists Board and is eager to share her industry contacts to help the League broaden its reach with people who are often left out of bicycle related conversations. She understands well the growth market of the casual female bicyclist. Martha Roskowski, V.P. of Local Innovation for People for Bikes, also began her professional bike advocacy career in 1990 running BikeWeek in her hometown of Boulder Colorado. In 1994 she became the Executive Director of Bicycle Colorado, and was then tapped to run the national America Bikes campaign which is where she recalls running into the most challenging sexism of her career. The League of American Bicyclists, the oldest bike advocacy organization in the U.S. (founded in 1880) has had two female Executive Directors, Cosette Simon in the late 1990’s, and Elisa Margolin in the early 2000’s. Women have also had key roles on their board. Karen Jenkins, Director Emeritus served as Chair of the Board of Directors through 2017, along with Gail Copus Spann, who served as Vice Chair. Originally from New England, Marin Tockman founded her Dashing Bicycles shop in New Orleans in 2014 originally in a shared space (with a coffee bar), and then on its own. She first became involved in bike advocacy in New York City during her time as a filmmaker where she discovered riding a bike was affordable and often faster than walking or public transit. After she moved to New Orleans she continued her advocacy work and this focus has helped shaped her shop as a vibrant community hub. Across the country female owned bike shops and bike-friendly brands focused specifically on, or greatly addressing the needs of, women are a growing trend. Not only are women creating more female-friendly bike products like Maria Boustead’s Po Campo, but at female owned bike shops like Pedal Chic in Greenville South Carolina, Gladys Bikes in Portland, and Dashing Bicycles in New Orleans women can be met right where they are in their bike riding needs—even if they’ve haven’t ridden a bike in thirty years, or ever. But it can be challenging for women to try and make progressive change and be more welcoming to women (and frankly all types of more casual riders) in what has been a very male and sport dominated field. “It’s not enough to say we know there are issues so go ahead you ladies and fix it. It’s taxing emotionally and very scary financially to take on a patriarchal system and survive.” Says Dashing Bicycle’s Marin Tockman. Yes! So pleased to see Deb Hubsmith recognized as a leader of the this movement. What's missing from this article? Recognizing women of color bike advocates across the country who have led equity conversations within active transportation circles.